Tagged under Yuusuke Murata, Studio Gallop, Series. Eyeshield 21 presents itself as a ridiculous, exaggerated anime. But if you look closer, you will realize there is a surprising amount of depth underneath each character. An anime that is intended to promote football becomes something much more significant, a story revolving around lifelike characters. Eyeshield 21 uses all of its elements to create a fascinating blend of two components: fast paced action contrasting against slow thoughtful moments. Each piece has a proper, powerful contrast. The outer personality blends with the inner heart. The powerful imagery and metaphors contrast with the human faces of the characters. The sound of vanishing ghosts and rushing trains work with the tense moments of silence. The anime is pretty good, but the fact that they change up some of the events and don't even actually 'finish' the series is a let down. The manga is the way to go! Either way, the series as a whole is AMAZING. Forget everything you know about American Football because this anime is nothing like it. When I first heard about this show I was skeptical that a manga/anime about American Football could be any good, but I was pleasantly surprised when I started getting into the story. Once you get past the first episodes that are kinda slow you'll find yourself more and more interested in the plot and what's going to happen next. By the time you get to the middle of the story, you'll find yourself yelling "TOUCHDOWN" everytime they score. This is a great anime and I'd recommend it for everyone, not just sports fanatics. At first, I didnt know anyting about Football. But because of this anime, I know most of it (the rules, the team, etc). Unlike other sport anime such as basket, soccer, or boxing, this one is about new sport. It's unique! Especially in my place which never played this sport. And it looks interesting. The characters are unique n have their own specialities, personalities, n problems. My favorite is Hiruma Yoichi! (I never heard someone who hates him) He is a devilish quarterback in his team. Of course he is not a real devil. He just has devil's personalities. /manga/ The sports series that everyone has been talking about! And, one that staunchly deserves its reputation! It was a hell of a ride, and I'm sure even non-sports manga fans would enjoy it. In other words, if you can read only one sports manga in your lifetime, READ THIS ONE. A blast through and through with true Jump themes in it's core. The most "Shonen Jump" series I've ever experienced that almost completely exists for the sake of it's themes. Themes to pay attention to regardless of your goals or ambitions. For most people, they may have that one series that they will always come back to, that will always be their favorite. For example: Pokemon or Naruto, or even a series that was never popular in the first place, but still stays with you. 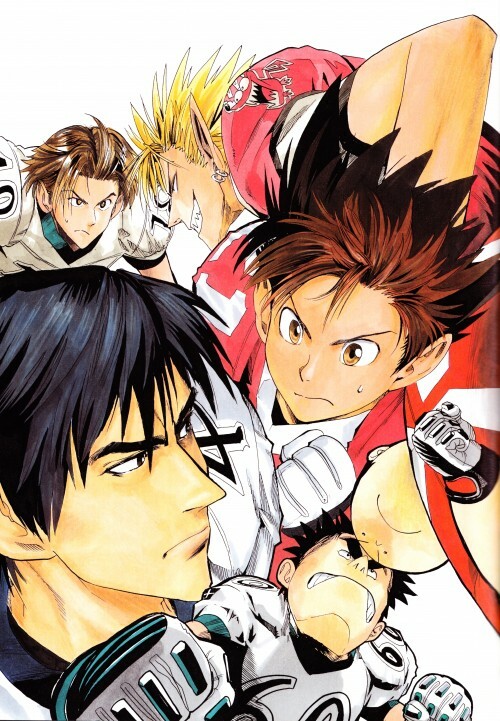 For me, Eyeshield 21 is that series. It combines just the right amount of drama, while still having comical elements. Too many times I have liked a series for it's comedy, but then the plot thickens and it loses it's humorous mood for much too long. To me, this makes the series less appealing (mainly because I don't deal with straight-on, heavy doses of drama very well). Yet Eyeshield 21 manages to sneak in small moments of humor that, instead of detracting from the intensity of their games and the excitement and anticipation you feel reading it, adds to the story. The games themselves are also pulled off well, as often they were each different enough that they didn't feel repetitive, and thus boring. What I really liked about this series, however, was the way the characters were written. I came to love many of the characters in this series, and really like how the characters in the opposing teams were not either tools, simply to better the main characters and then be forgotten, or just-plain-evil antagonists. In essence, there were times when I actually was routing for the other team, because I liked them that much. All in all, Eyeshield 21 is definitely that one series that I will compare all others to, and will come back to again and again. The anime is cute for the voices but the animation lost a lot cause of the ugly designe. In my advice is better read the manga because the title deserve to be read since it's one of the most awesome sport manga ever!